The difference between Overgard (Mikkelsen) and John Q. Public scrapping coagulated powder in the frozen suburbs of Minneapolis, Chicago, Buffalo, Toronto, Boston, and Spokane is the latter poor soul can – at least – catch reprieve inside a heated home stocked with hot chocolate. Overgard, however, finds no such balmy comfort, but actually, a crashed carcass of an aircraft does serve as an indispensable refuge. 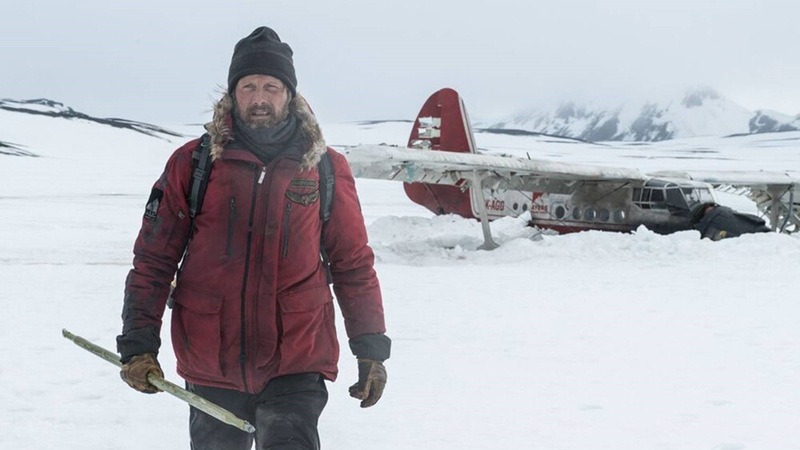 Like “127 Hours” (2010) and “Cast Away” (2000), the harsh environment forces our solitary hero into resourceful ingenuity, but unlike those films, “Arctic” does not flashback to leisurely moments or capture stretches of screen time in urban civilization. Here, the movie – which was filmed in Iceland – is always set on location, and it’s up to Mikkelsen to carry the torch throughout the picture.